Part of the fun of the iPhone is discovering “new” features that were there all along. Here are three that might be new to you. 1. See if something is level. Believe it or not, you check for level using the Compass app. The way you do it is you swipe left while looking at the Compass. 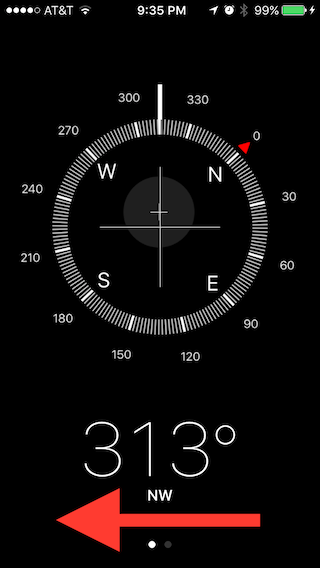 This brings up the little-known second page of the Compass app, which is really a level. After swiping left, lay the iPhone down flat to see if your pool table is level (watch the bubbles ) or put it on edge to see if your paintings and TV are hanging straight on the wall. Whether flat or on edge, when it’s perfectly level the screen turns green. Easy, useful, and fun. 2. Have it read out loud to you. You have to take a trip to the Settings to enable this feature: go to Settings, then General, then Accessibility, then Speech, then Speak Screen (turn it ON). You will be able to control the speaking rate later so don’t worry about doing it now. 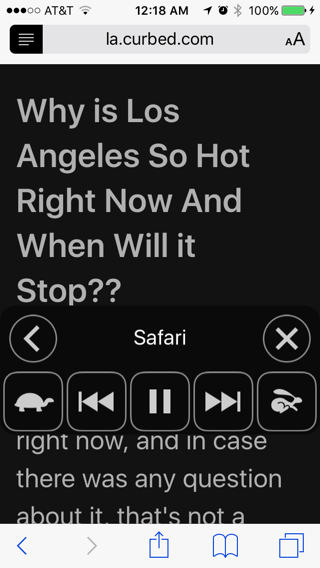 The Speak Screen feature has been around since iOS 8 and it’s still one of my favorites. Works in Safari, works in Kindle, works in Books. Works just about everywhere. (The feature is called “Speak Screen” but it actually reads more than just the “screen.” It will speak until it runs out of text, scrolling down past what you see on the screen, and even turning pages in Books. Yes, that’s right: it turns pages in Books.) 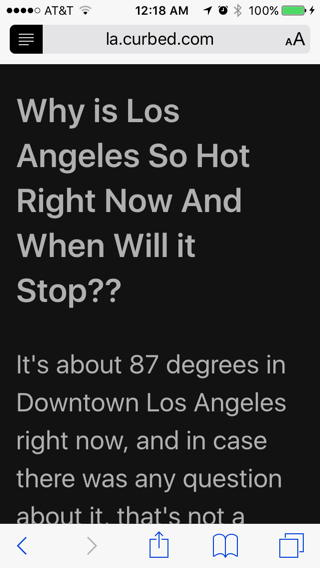 I use this feature to have my iPhone read news articles to me while I cook– sort of like listening to the radio. 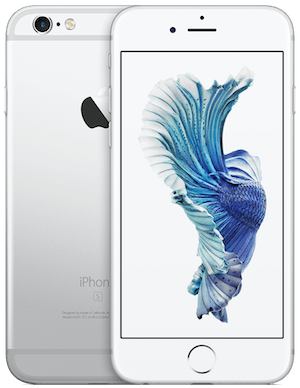 After you’ve turned on Speak Screen, having your iPhone read to you is just a swipe away. But it’s a very particular swipe: a two-fingered down-swipe, starting above the glass. You’ll be an expert after doing it once, so give it a try. See the picture below. 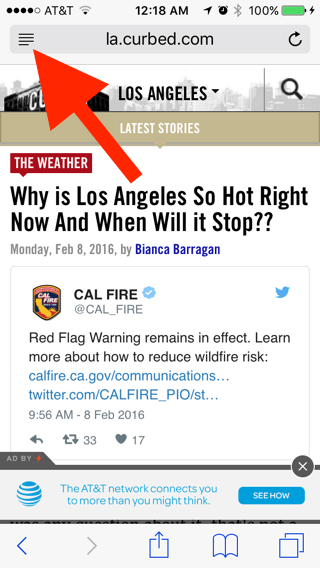 Of course this works better if your iPhone is displaying something worth reading. Do it with a web page, or in News, or somewhere else with lots of text. For web pages (in Safari) it makes sense to switch to the Reader mode, by tapping the Reader button at top left of the screen. Reader mode simplifies the layout (making it nicer for you to read by eye as well). So bring up a web page— maybe this one!— and then switch to Reader mode, and then…. put TWO fingers at the top of the screen. Actually, put them ABOVE the top of the screen—- on the part that doesn’t light up. Then, swipe down quickly. If you do it properly you’ll see something like this— and you will hear the page being read to you. You can speed up the reading by tapping on the rabbit. Slow it down by tapping on the turtle. Pause when you need to and restart when you’re ready. The controls will collapse after a short time, to get out of your way– bring them back with a tap on the arrow pointing right. (Collapse them immediately with a tap on the arrow pointing left.) Tap the X to put the Speak Screen controls away completely. Note that you can even leave the app your iPhone is reading from– that is, you can use other apps– and the iPhone will keep on reading whatever it started. The controls stay visible even when you switch apps. 3. Add items to your Grocery list (or any other list) via Siri. Wouldn’t it be cool to be able to add things to your grocery list when you think of them, on the run, via Siri? Of course it would be. I do it all the time. Here’s how. We’ll use the Reminders app for this. Make a new list in Reminders (use the big “+” at the top right of the Reminders apps screen) and call it “Grocery” (or something else that you will want to add items to regularly). Then, press the Home button (and keep it down) and say “Add peanut butter to my grocery list,” and then let go of the button. Siri will respond, saying “I’ve added it.” Then, when you go shopping, what do you know, there’s peanut butter on your grocery list. Really cool. You think you’ll remember stuff like peanut butter but if you let the iPhone do it, your mind is free to think about other (presumably) more important things. The key to making this work: start with the word “Add” and end with the name of your list. And there you have it: three things that anyone with an iPhone can do, right now, because those features make use of the iPhone’s built-in apps. Try each one and I’ll bet at least one will become a habit.